before being introduced to the trinomial cube. 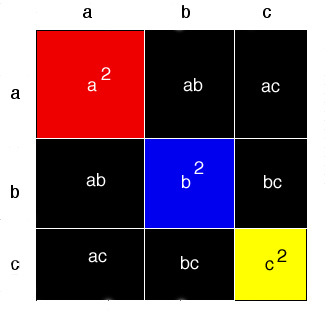 blue, and "c2" is yellow and all other faces are black. The child matches the pieces by color. The result is a cube. The teacher sits next to the child at a table. Holding the lid on the box, she turns it upside down on the table. She lifts the box off the cube carefully, and looks at the different sides of the cube and with the child. The teacher removes one layer of the cube at a time and places it on the table. If the box is hinged, the teacher may simply begin removing pieces from the hinged box and set out three layers on the table. arrangement of pieces on the table. The child and teacher spend a little time looking at the lay-out. need more demonstrations on subsequent days.